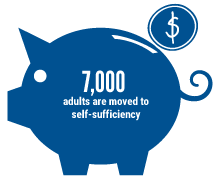 Goal: Move 7,000 adults to self-sufficiency by 2025. Ensuring adults and families reach self-sufficiency by providing education, job training, financial literacy and debt reduction programming, increasing social capital, removing barriers to physical and mental wellness, and improving housing stability. United Way will invest in programming that promotes a community working together to provide adults and families the opportunities required to earn income, grow income, and save income to increase self-sufficiency and reduce poverty. Priorities include ensuring availability of community navigators, enhancing financial stability programming, and increasing social capital so individuals are supported and connected to lead healthy lives. Funding priority will be given to organizations that collaborate on programs that focus on obtaining the following objectives. United Way is seeking leaders and innovators to be change agents within our community to ensure a positive future for Lebanon. Increase knowledge and resources to budget, save, and access banking services. Increase number of adults managing debt and building credit. Increase number of adults earning a living wage. The following indicators have been identified to measure the ongoing success of Empowering Adults & Family as we work towards our 2025 goal.